To the basic mayo recipe, I added a spoonful of dijon mustard and extra lemon juice; the recipe did work (although the texture wasn't quite as lovely as the yolks-only, lovingly hand whisked versions). My only complaint was that the quality extra virgin olive oil I used made the mayo seem a bit too rich and mineral-y. It was edible, but I didn't want to go through the trouble of lacto-fermenting it, and I didn't have a good excuse to go all out on a mayo binge to use up the cup or so I had leftover. I also didn't think I could pass it off on the rest of the family - I have one kid who can't even eat condiments yet, another who won't eat them out of choice, and finally a husband who is a harder sell than I am. Fortunately I remembered about salad dressing cake. 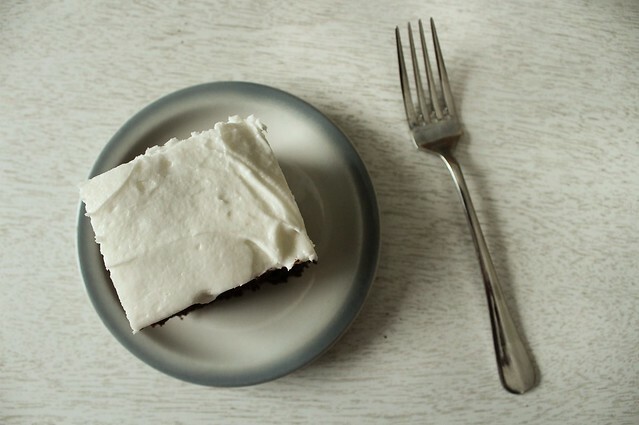 Salad dressing cake could very well be the first cake I ever made myself, mixing the simple, pantry-staple ingredients with a whole cup of mayonnaise, Miracle Whip actually, which was what we called mayo at my house growing up. It was proof that miracles do indeed exist. How on earth could you make a chocolate cake with a cup of sickly sweet and thick Miracle Whip that left no trace on the tongue of mayo? How could you make a cake that was so perfectly full of moisture, a good keeper at room temperature or in the fridge, and barely messed up the kitchen? It's magic. And I'm glad I remembered it now. You can frost this cake however you see fit, but I can't properly enjoy an everyday chocolate cake at my house without a simple butter infused, powdered sugar based buttercream spiked with almond extract. 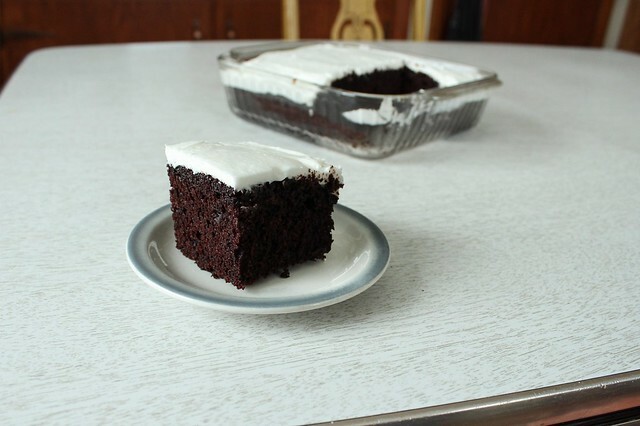 I don't ever measure, I just try not to make too much, and if I do, I store the leftover in a glass jar until I need to make another cake - which will then usually happen sooner than later because I have extra frosting. It's a vicious cycle. I also encourage you to make immersion blender mayo with 100% olive oil for this recipe. You get a nuance of olive in the background for those that are interested in tasting it, yet it's subtle enough that the rest of your family won't go noticing it. They'll just think you made the best chocolate cake ever. Preheat the oven to 350 degrees. Butter a glass 8x8 inch baking dish. In a large mixing bowl, sift or mix well the dry ingredients. Pour the wet ingredients over the dry and stir until just mixed thoroughly and no dry spots remain. 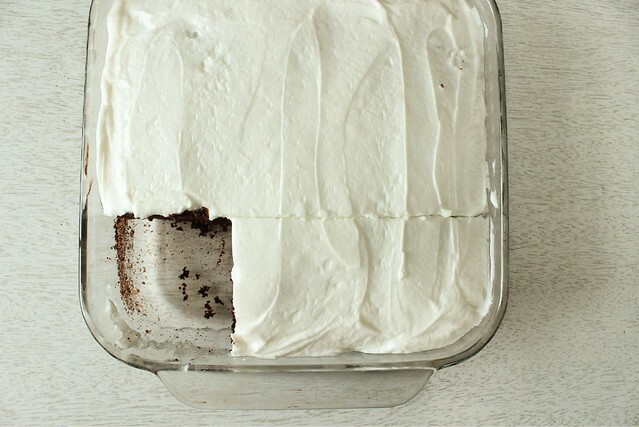 Use a spatula to ease it into the prepared baking dish, and smooth the top out towards the corners to counteract some of the doming action in the center as the cake bakes. Bake in the preheated oven for 35-45 minutes, until a tester comes out clean. Cool completely before frosting.